Savor Home: Just Saying Hi! Did you enjoy my guests this week?? I thought their posts were fabulous! A big thank you to Donna, Natasha, and Kim for filling in for me! I also want to welcome my new friends! Thank you for your sweet comments and I hope you enjoy my blog. I leave you with these gorgeous images. I LOVE the fresh look. I'll be living vicariously through them over the weekend- wishing I could spend my it in this kitchen cooking, baking, drinking wine and entertaining friends. Don't you love the legs on those barstools?? Modern meets rustic... Lovely combination here. I did enjoy the guests blogs! I am loving everything about these rooms! Great pics! LOVE those barstools! Love the candlelier above the island, too. Thanks for sharing. Hi Tiffany! I think all your guests were great! 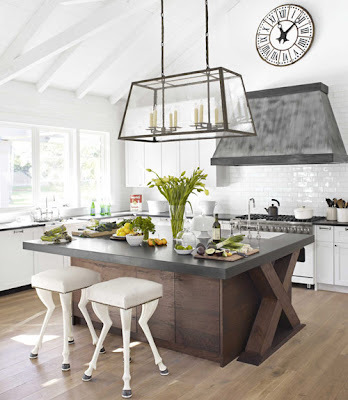 Love the featured kitchen....especially the light fixture over the island! Those barstool legs look like (some sort of animal legs...maybe a cow?!!! Lol)and the dining room...great! Love the dark wood against the white! Loved your guest bloggers this week, they did an excellent job. This house is incredible, I could not get over it when I saw it in House Beautiful. I would love to attend that brunch...what will we be having? Tiff! Its Kim, I keep meaning to tell you how much I love your blog! I started reading it way way too late but I'm catching up and enjoy it and have it at the top of my bookmarks! Hope the next week isn't too brutal for you. Hugs!